Thanks for stopping by to see my last post for 2017! I cannot believe that we are about to usher in another new year! The years seem to go by faster and faster as I get older (and older). These cards were quick and easy to put together. I used the Striped Sentiment Strip Cover Up from My Favorite Things to create the top layer. I love the pretty colors I created with just a few Distress Inks and the colors really pop against the black card base. I added a few splatters of Gansai Tambi White Gold watercolor to my panels. 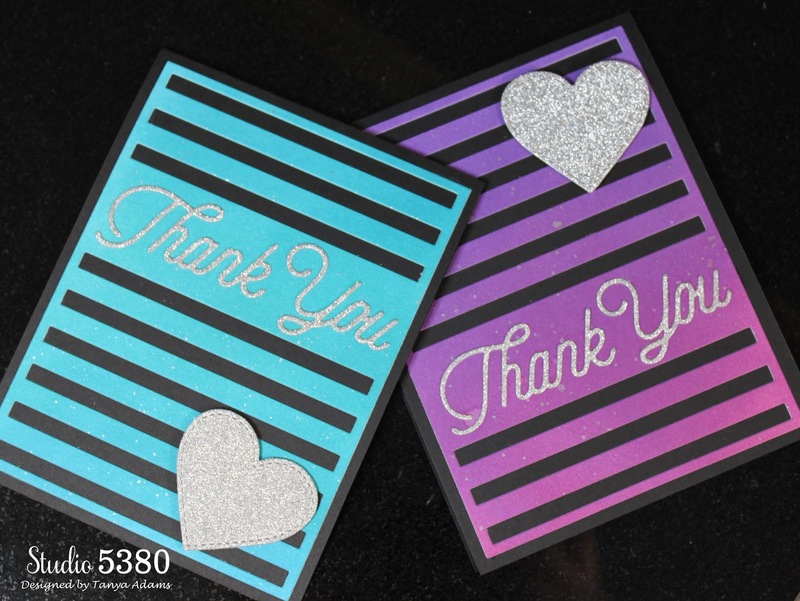 The Thank You sentiment and heart are cut from dies made by My Favorite Things. Well, I guess that wraps it up for this year! Thank you for all the visits and sweet comments over the year and years passed. I always look forward to and appreciate your kindness. Have a wonderful New Year and I hope to see you soon! Happy New Year - Love the Thank you cards so pretty. WOW! Both of your cards are absolutely GORGEOUS!! Happy New Year!